Purobio Vegan Nourishing Base nourishes dry skin before applying make-up! Creamy texture, the combination of organic shea butter, organic olive oil and apricot oil moisturizes even the driest and cracked skins. Thanks to its ultra-softening action, it dries quickly for an immediate application of your foundation. With Purobio Organic Anti-Dryness Base, your complexion is sublimated and unified! For a velvety & soft touch with PUROBIO Dry Skin Foundation ! With your fingers, apply a small amount of base to the face and spread evenly until completely absorbed. Avoid the eye area, this more delicate area requiring specific products, don't use too much base to avoid the skin is too satiny, which would make it difficult to hold makeup. For combination skin, we recommend applying the base for dry skin and the base for oily skin on areas of shine (T-zone) due to excess sebum on dry areas of the face. 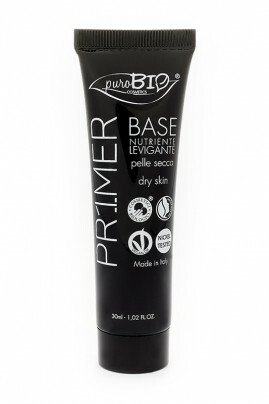 PUROBIO Vegan Base for dry skin is nickel free! INCI: PHYLLOSTACHYS NIGRA EXTRACT*, MICA, SUCROSE PALMITATE, CAPRYLIC/CAPRIC TRIGLYCERIDE*, SILICA, FRAGRANCE, CETEARYL ALCOHOL, GLYCERYL STEARATE, TOCOPHEROL, OLIVE GLYCERIDES, POTASSIUM PALMITOYL HYDROLYZED WHEAT PROTEIN, GLYCERYL CAPRYLATE, SODIUM STEAROYL LACTYLATE, APRICOT KERNEL OIL POLYGLYCERYL-4 ESTER, AQUA (WATER), GLYCERIN, MICROCRYSTALLINE CELLULOSE, BUTYROSPERMUM PARKII BUTTER (BUTYROSPERMUM PARKII (SHEA) BUTTER)*, OLEA EUROPAEA FRUIT OIL (OLEA EUROPAEA (OLIVE) FRUIT OIL) *, CELLULOSE GUM, SILVER(77820), CHLORELLA VULGARIS EXTRACT, MARIS AQUA (SEA WATER), HYDROLYZED ALGIN, CELLULOSE, XANTHAN GUM.